Some notes: the front styling of the C-Class is taking a cue from the larger S-Class with similar lines. 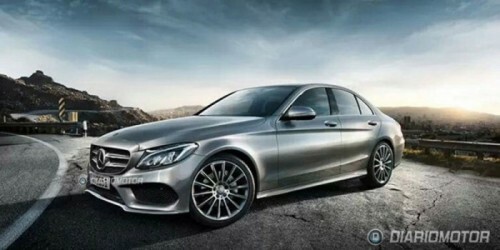 The C-Class will use Mercedes’ MRA rear-wheel-drive platform, which is used in the larger E-Class and S-Class models. This will allow Mercedes to make the new C-Class around 220 pounds lighter than the current model. The 2015 Mercedes-Benz C-Class is expected a have turbocharged 1.8-liter engine in the base model. A V-6, a diesel engine, and a hybrid will follow. The AMG model is set to receive a powerful new twin-turbocharged 4.0-liter V-8. This entry was posted in GETWhipped and tagged 2015 Mercedes-Benz C-Class, Luxury Sedans, Mercedes, Mercedes-Benz. Bookmark the permalink.